I am Sananda. I want to remind you of your own greatness – your own Divinity. Each one of you are Gods or Goddesses. I am one of you. My life on Earth was “not a walk around the pond”, just as your lives also have not been so. We have all tried to walk in the hard school in the heavy energies on Earth. “I am the Wah, the Truth and the Light”, refers to the knowledge you have forgotten about. 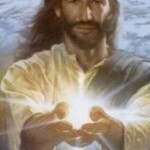 I am your soul, YOUR SELF, not me Jesus/Sananda. You should say this to yourself and understand it is true. The path into your heart is the Riddle. There you have the Truth. When you find the Truth you are in the Light. You have always been there, but your twisted and frightened has made it so that you have not always seen the light during for an extended era. Thus, understand that you are divine. And when you listen to your heart and do what is right here and now, when you are like children, then suddenly you find your own greatness. The path through your own heart is the path to the divine. Seek the connection with your heart through what engages you, engages your soul – Nature, animals, playfulness, creation, music, togetherness with your good friends, in short everything that gives you joy and makes you forget time and space. Meditation is also important. Give yourself moments every day to land in yourself. Receive the message from yourself, from yourself on the other side. You all have a higher Self, your soul who is looking for you. You also have guides, your spiritual guides and angels that you can ask for help. Ask them to help you with your next move. Ask them to take your hand and show you the way. Remember, You are the Way, Truth and Light. The Light of Mother/Father God shines strongly in you as in me. In Gods eye we all have the same value. We are all Brothers and Sisters in this shining Universe. All my love from my heart to your heart. And may Love and Light be spread over the Earth, as it is time now my friends. It is time to co-create a world in peace, love and light.